In recognition of the distribution of one million books by Page Ahead from 1991 through 2003, Washington State Governor Gary Locke issued a proclamation. Washington State Senator Patty Murray recently praised Page Ahead "for making great strides in the fight against illiteracy." Encouraging the love for reading is crucial to the development of youth. Supplying at-risk children with books to read, holding motivational literacy programs and increasing parent and adult involvement in education are crucial factors in the overall development of children. You are to be applauded for making great strides in the overall fight against illiteracy. On March 6, 2004 Page Ahead received the "Literary Lions" award from the King County Library System Foundation. In 2003, Page Ahead was recognized by the Municipal League of King County for outstanding contributions to the public good. Along with five citizens who received awards for civic excellence, Page Ahead was honored at the 44th annual Civic Awards Luncheon on Friday, May 23 at the Westin Hotel in downtown Seattle. Retiring Washington State Supreme Court Justice Charles Z. Smith delivered the keynote address. William Gates Sr. received an award for regional leadership. In 2005 Page Ahead received the "Golden Apple Award" for excellence in education. More than 150 individuals and organizations from across Washington were nominated to receive this award, and 12 were selected. 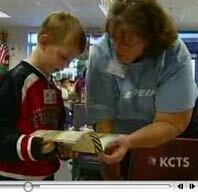 You can watch our portion of the KCTS Golden Apple Awards Ceremony.